Great Motorcycle Tours of Europe and Magnificent Motorcycle Trips of the World/Great Motorcycle Journeys of the World are available from all good bookshops and from Amazon UK and Amazon USA. 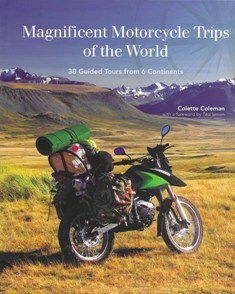 Updated softback version of the best selling Great Motorcycle Journeys of the World (2008). Featuring 38 awe-inspiring routes from the snowy passes of Patagonia to Australia's Red Centre, this is the perfect inspiration for your next big motorcycling adventure. All the featured journeys can be taken as part of a one-to three week trip, or linked to form a longer trip. You can choose to take your own bike, hire one on arrival or pick up a bike as part of an organised tour. 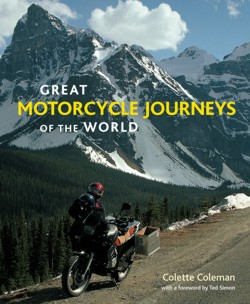 If you've ever wanted to explore the world by motorcycle, this book will inspire you to get out there and head off on your own adventure. 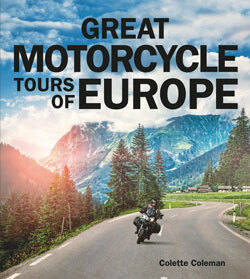 This is the perfect introduction to some of the most inspiring motorcycle routes in Europe. Packed with stunning photography and practical information Great Motorcycle Tours of Europe contains everything you need to start planning your European motorcycle adventure. Experience the snowy peaks of Norway's Arctic Circle, head to the balmy French Riviera, ride through the valleys and peaks of the Italian Dolomites and tackle the twists and turns of Romania's Transfagarasan Highway. Each tour features a locator map together with a fact file giving practical information on the route's length and terrain highlighting local sites and events, and including a wide range of valuable tips. 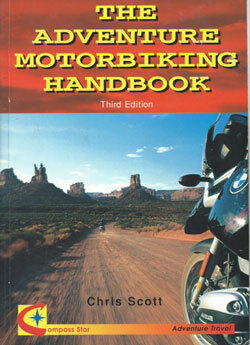 This book will make planning your ride a pleasure. Adventure motorcycle travel is more accessible than ever. It is now possible to ride in some of the world's most remote regions in the space of an average holiday, picking up a bike on arrival and, if you don't want to go it alone, joining a group of riders from across the globe. All the featured journeys can be taken as part of a 2-3 week holiday, or linked to form a longer trip. You can choose to take your own bike, hire one on arrival or pick up a bike as part of an organised tour. 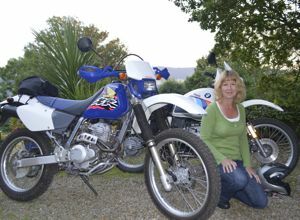 Whether you are an experienced overlander looking for a quick adventure fix, or a novice rider seeking inspiration these journeys will open up a whole new world of motorcycling possibilities. In 1997 I formed part of the team that contributed information and hands on touring experience to Chris Scott’s very first edition of the Adventure Motorbiking Handbook now on its 6th edition. In addition to writing motorcycle travel guidebooks I have written for The Telegraph and Honda Dream magazine, and provided brochure text and promotional literature for adventure travel companies and features for travel magazines.